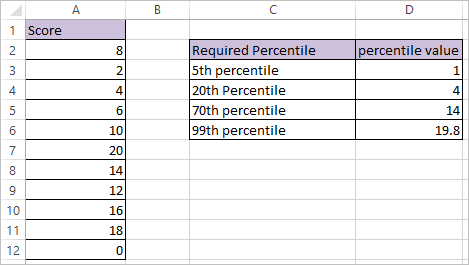 PERCENTILE Function in Excel returns the value of Kth percentile for a supplied range of values and supplied k.
array – The array of data values for which you want to calculate the Kth percentile. First Example Calculates the 5th percentile by interpolating the values which result in 1(by taking range and percentage value for k as input). Second and third examples calculate 20th and 70th percentile respectively by taking the range and decimal value of k as input. last Example Calculates the 99th percentile by interpolating the values which result in 19.8 (by taking range and percentage value for k as input).